Do not need to be Fully Discharged before being recharged. These Ni-MH batteries are an ideal replacement for appliances with longterm use. Instead of needing to buy more batteries, you can simply recharge these saving you money and waste treatement needed for the hundreds of alkaline battery . You can use these rechargeable batteries in the same appliances just as you would for alkaline batteries. They do not need to be fully discharged before being recharged.These batteries are Ideal for Cameras, iPods and MP players. 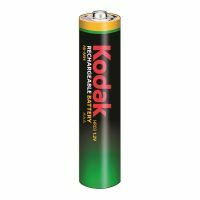 To Recieve updates and possible rewards for Kodak Kodak Uncharged AA please sign in. To Recieve updates and possible rewards for Rechargeable Battery please sign in.